Hennie Botes, an advisor to the $300 House, is featured by the World Economic Forum for his innovative housing system - moladi. Anthony Ulwick is now an advisor to the $300 House. Philip Kotler is now an advisor to the $300 House. Christian Sarkar holds 3-day innovation workshop for global company on BoP Housing. The Ecosystem of Poverty: Lessons Learned from the $300 House Project by Abhijit De and Christian Sarkar. Amit Kapoor, President & CEO of the India Council on Competitiveness is now an advisor to the $300 House project. Christian Sarkar moderated the Global Affordable Housing session at the 2nd BOP Global Network Summit with CEMEX, TATA Housing, and the Solar Electric Light Fund. Take our Affordable Housing Survey. The survey covers three critical domains: I. Business Models, II. Partner & Support Ecosystems, and III. Measuring Impact. Christian Sarkar speaks at the Foro Latinoamericano de Vivienda Adecuada. Whatever Happened to the $300 House? Stephan Butler joins the $300 House as an advisor. Nitin Sharma, Shourin Roy and Kyle Elllicott join the $300 House as advisors. Eric Ho (Architecture Commons) joins the $300 House as an advisor. Salem Avan joins the $300 House as an advisor. Kate Bulkley joins the $300 House as an advisor. Harvey Lacey joins the $300 House as an advisor. Owen Geiger (GRISB.org) joins the $300 House as advisor. Christian speaks at Activate 2011 about the $300 house (video). The Winners of the $300 House Open Design Challenge Congratulations! 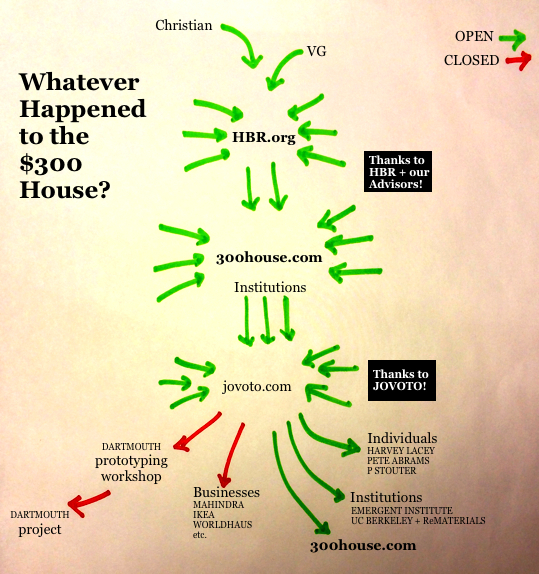 The $300 House: A Hands-On Approach to a Wicked Problem (Harvard Business Review) our rebuttal to the NY Times Op-Ed. $300 slum house? Worthy but worthless (The Berkely Blog). Hands Off Our Houses (New York Times) Op-Ed challenges the $300 House. Stacey Lawson (CET, UC Berkeley) joins the $300 House as an advisor. Erich Habian (Wienerberger) joins the $300 House as an advisor. Roland Merten (BASF) joins the $300 House as an advisor. Helen Walters (Doblin) joins the $300 House as an advisor and judge. Larry Keeley (Doblin) joins the $300 House as an advisor. Madhav Chavan (Pratham) joins the $300 House as an advisor. Ophelia Dahl (Partners In Health) joins the $300 House as an advisor and judge. Patrice Nevil (Zanmi Lasante) joins the $300 House as an advisor and judge. Paul Miller a.k.a. D.J. Spooky joins the $300 House as an advisor. $300 House Open Design Challenge launched! Valeria Budinich joins the $300 House as an advisor. Rahul Mehrotra joins the $300 House as a judge and advisor. Jack Wilson joins the $300 House as an advisor. Bastian Unterberg joins the $300 House as an advisor. Paul Newman joins the $300 House as an advisor. Yves Behar joins the $300 House as a judge for the design challenge. Daniel Johnson joins the $300 House as a judge and advisor. Michael Gordon joins the $300 House as an advisor. W. Scott Tew joins the $300 House as an advisor. Javed Matin joins the $300 House as an advisor. John Bielenberg joins the $300 House as an advisor. Byron Katie joins the $300 House as an advisor. Chairul Tanjung, the Chairman of the National Economic Committee of Indonesia, joins the $300 House as an advisor. Toby Cumberbatch joins the $300 House as an advisor. Paul Polak joins the $300 House as an advisor. Benjamin Linder joins us as an advisor to the $300 House. Dave Cranmer joins us as an advisor to the $300 House. Shaun Abrahamson joins us as an advisor to the $300 House. Derek "Deek" Diedricksen joins us as an advisor to the $300 House. Christina M. Alfonso is now an advisor to the $300 House. John Tammaro is now an advisor to the $300 House. Ryan Henderson is now an advisor to the $300 House. Vinay Gupta joins us an advisor to the $300 House. Samuel Freeman is now an advisor to the $300 House. US Airways features the $300 House in its in-flight magazine. Reggae star David Hinds (Steel Pulse) is now an advisor to the $300 House. David Sands blogs about the $300 House in HBR. Doug Pushard joins the $300 House advisory group. Alex Bogusky introduces COMMON, includes the $300 House! Daniel Klein-Marcuschamer is now an advisor for the $300 House. Christian Blyt joins the $300 House advisory group. The Co-operation Blog mentions the $300 House. Ramona Albert joins the $300 House advisory group. Kevin Roberts, CEO of Saatchi and Saatchi, gives the $300 House a mention! Rafael Smith is now an advisor for the $300 House. Stuart L. Hart is now an advisor for the $300 House. Manoj Sinha of Husk Power Systems is now an advisor for the $300 House. Umair Haque is now an advisor for the $300 House. The $300 House gets a favorable mention in The Economist blog. Harvard Business Review's Scott Berinato is now an official advisor to the $300 House. VG's 2011 Agenda in the Harvard Business Review is our $300 House! The idea of the $300 House originated with Christian Sarkar, an entrepreneur and marketer who came up with the idea while working on a project in Haiti, helping the Solar Electric Light Fund raise money to solar-electrify clinics for Partners In Health. To promote the idea of the $300 House, Christian submitted a blog post to one of his clients at the time, Professor Vijay "V.G." Govindarajan at Dartmouth, and suggested they send it to the Harvard Business Review. As spokesman for the idea, VG was awarded the Thinkers50 "Breakthrough Idea Award" in 2011. The $300 House still needs you: students and teachers, individuals, universities, institutions, businesses, and governmental agencies - learn how you can participate! We are continuously building and rebuilding this online collective - with passionate, caring participants who choose to collaborate to make this project a reality across the planet.